I would be interested in a sprocket nose. 12 or 14 inch bars. I have 2 of these Power Mac 6s and both are equipped with 14" hard nose bars and I would really like to have sprocket nose bars for them. It is a simple matter of changing the sprocket to 3/8 and there will be a whole range of sprocket nose bars available. All of the later saws came with 3/8" L.P. chain in favor of the 1/4". I have thought about changing both over to 3/8" LP. The chain is cheaper when you buy it. I just have to find a couple of sprockets. Have not looked to see what fits but I am sure I can find out or someone (Mark) could tell us what size is needed. But I would like to stay with the 14" bar or maybe a 12. I have hard nose 14 on both but I prefer sprocket nose if I can find them. Thanks for trying I really appreciate the effort. I have a couple hard nose McCulloch 16" bars in alright condition if someone needs them. The same drum/sprockets work on all Mini Mac and Power Mac 6 saws. You should not have any trouble finding a drum with the 3/8" sprocket. There are some differences in the clutch itself, some were held on with a nut, some had the nut built into the spider, and the diameter of the shaft/bearing changed but the external parts of the clutch are all the same. In the worst case you might have to press one bearing out and another in its place. Ok I have a 140 giving me trouble. It will start and run fine like first thing in the morning. You can cut with it for almost a tank of fuel, shut it off for just 3-4 mins and it will start right back up. Shut it off and do something like stack wood for like 20-30 mins and when you try and start it you have to choke it and feather the choke for a while to keep it running until finally it will take off and run. Then after that you can shut it off and let it set for 3-4 mins and it will start right up and saw but if you let it set for 15-20 mins then you have to feather the choke for a while just to keep it running until it finally starts to run right. Any ideas on this? I have kitted the carb, new crank seals, new fuel lines. Saws great until you have to shut it down for a while and then it is a pain to get back running. A friend gave me a mini mac eager beaver -110-2.0 cid. The air cleaner cover was missing and no where to be found. I eventually found another cover and filter but the cover hold down screw thread is in question. I only get 3 turns with a 10-24 and it bottoms out/locks up. The hole looks like striped threads about 8 threads deep. The IPL simply calls it AF cover screw, PN 91796. All of the other screws I see are described as inch threads. Checked an eager beaver 2.0 and it is 10/32 x5/8"
I got my AF cover yesterday, came with the screw!!!! 10-24 it is. I get 2-1/2 turns engagement in the threads. Got a new clutch/sprocket today, 1/4-8 matching the 14" bar(off the old/dead MM6). 70dl too tight and 72dl too loose, so I will need to spin-up a 71dl chain. PHO is 9lb 5oz dry. I do see the start pulley as a weak spot on these...mine is well worn but works........ for now! My MM6 need a few bits to get it going before I do a 5 saw comparison of my 5 smallest saws. The test will include (2)Homelite XL-2 (one 1/4" and one 3/8lp), Echo SC280EP, MM6, Poulan 1800. They all run great except...you guessed it..the MM6. My needs are mainly for a black handle 83852 where the long plastic screw had busted it wide open. Also a handle retaining 5/8" long screw 110640, spacer 84519 and triangular washer 84520. Also needed is the long skinny return spring 83946 at the bottom of the manual oiler push rod. I have a MDC carb kit, new clutch, 12" sprocket nose bar and will make up a new stihl RM13 1/4" chain upon final assembly. The big saws, 2 eager beavers, are also getting some attention at the same time for the next bigger group test. Did more research and discovered the homelites and the poulan are reed valve intake and the Echo and MM6 are piston port. Wonder how they will perform? The MM6 carb pressure regulator diaphragm was hard as a rock and therefore renewed, and have to make a manifold gasket to reassemble. I got it fired up on carb prime. While studying the assembly procedure... I remembered that the insides of the case was absolutely 95% full of saw dust cake except in the direct fan blow through area around the fins. Then looking in front of the muffler but in the rear of the clutch cover area that it was totally open and not shielded in any way from the saw dust and chips coming off the chain. I looked the area over and saw two #12 threaded holes on the back of the barrels. It only took a few minutes and wondered if ever a properly shaped flat piece of aluminum sheet mounted on two round standoffs mounted by some #12 screws would create a"back wall" to the sprocket area?... Would the cases get so packed with dust cake? I cut a little piece of cardboard to try it on for size. Looks good to me. I know most of you won't admit but you have worked on one of these little guys somewhere a long your CAD infection, if not you wouldn't have realized how much of a pain they are. 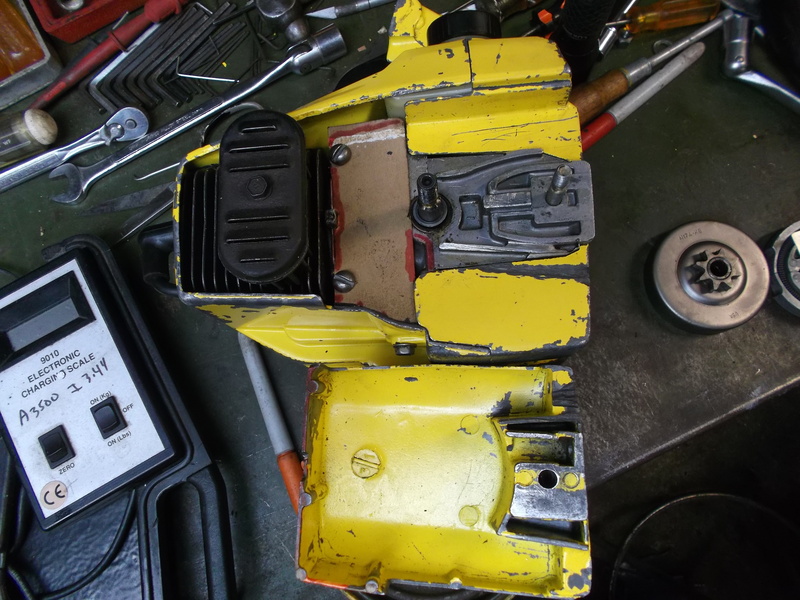 If you're including the modern no idea who made it plastic "jobbies" then repairing them "You're on your own kiddo"
Pix of the shield cardboard template to potentially keep out the saw dust cake from filling the body. I'll make one out of aluminum prior to putting the clutch and new sprocket back on. For complete coverage, it will include the little red area adjacent to the crankshaft.